I haven’t blogged much about Carlos Ghosn, though I’ve Tweeted aplenty since his arrest last November. Earlier this week, his lawyers released a video of Ghosn stating his position, and it echoes much of what I had Tweeted. He couldn’t make a personal appearance at a press conference himself, thanks to some conveniently timed (for Nissan) evidence that prompted another arrest by the Japanese authorities. The way the original exposé was done and the way the Japanese mainstream media lapped up the one-sided story and propagated it verbatim told me immediately that something was rotten inside Nissan. A lack of investigation should always tell you that not all is what it seems. While it’s true that Nissan is worth more than Renault now, we can’t forget what a terrible shape it was in at the time the alliance was forged. While Nissan could have declared the Japanese equivalent of Chapter 11, it’s interesting to speculate how it would have emerged: would it have saved face or would consumers have lost confidence, as they have with Mitsubishi? And in the wake of Ghosn’s arrest, stories in the western media began appearing: Nissan’s performance was faltering (‘mediocre,’ says Ghosn). It had had a recent scandal and a major recall. More likely than not, it meant that certain heads were going to roll. To save themselves, they rolled their leader instead. We’ll see if there has been financial impropriety as things proceed, but to me there’s an element of xenophobia in the way the story has developed; and it was a surprise to learn at how ill-balanced the Japanese legal system is. I’ve been vocal elsewhere on how poorly I think elements of both companies have been run, but Ghosn does have a valid point in his video when he says that leadership can’t be based solely on consensus, as it’s not a way to propel a company forward. I’m keeping an open mind and, unlike some of the reporting that has gone on, maintaining that Ghosn is innocent till proved guilty. It’s dangerous to hop on to a bandwagon. It’s why I was a rare voice saying the Porsche Cayenne would succeed when the conventional wisdom among the press was that it would fail; and why I said Google Plus would fail when the tech press said it was a ‘Facebook-killer’. Ghosn deserves to be heard. Over the weekend, I noticed Autocade’s page-view stat had ticked over the 15,000,000 mark. In fact, it was at 15,045,000, and I estimate that it hit the milestone around February 6—fitting for it to have taken place as the (lunar) year began. With how busy things have been, Autocade has been updated less, but the traffic stats are promising, especially as Stuart Cowley and I film more segments for the Autocade video channel. As the year has started in earnest, there will be more updates, and the Salon de Genève next month usually pushes me to write more. Hopefully that will give our page-view rate a bit of a boost, considering it has slowed since September 2018, when I last posted about this topic. The trouble these days is that a lot of entries are about same-again SUVs: at the time of writing, of the last 20 newest entries, there are the Volkswagen Tayron, the Yusheng S330 and S350, the Chinese Ford Territory (based on the Yusheng S330, so it seemed logical to do these at the same time), Lexus UX, Acura RDX (TC1), Volkswagen Tharu, and the Brazilian and European incarnations of the Volkswagen T-Roc (they are different cars; and the Chinese one hasn’t been added, either). Once upon a time, such vehicles would have been relegated to an appendix in publications such as Auto Katalog, but now it’s regular motor cars that are becoming the niche products. The electric revolution has also been interesting, but also frustrating, to cover. Autocade is fun when you’re examining lineages; at this point in history, none of these electric models actually replace a petrol or diesel one completely. It’s also been tough getting technical data on some electric cars, the kWh rating, for instance, which we’ve been using as the equivalent for cubic centimetres in the entries. Hence the updates have slowed, because it’s harder to paint a complete picture about some of these cars. With China responsible for so many new releases, translation can be slow, especially for someone whose grasp of written Chinese is roughly that of a child’s, though at least I bridge two cultures well enough to weed out some of the obvious errors (e.g. people reporting that the Senova D80 was based on a Mercedes-Benz, which could not possibly be true). Following my tradition on this blog, here is how Autocade’s viewing’s going. In September, Autocade had 3,755 model entries; it’s now up to 3,781—not a huge jump, possibly accounting for the traffic rate decrease as well. Here’s hoping for a bit more as the year progresses. I’d like to add in an entry for the new Mazda Axela, for instance, but sometimes you have to wait till the company itself publishes public data on its website, just for that extra accuracy. We’ll wait and see. Above: Behind the scenes of the Škoda Karoq road test for Autocade. I hadn’t kept track of Autocade’s statistics for a while, and was pleasantly surprised to see it had crossed 14,000,000 page views (in fact, it’s on 14,140,072 at the time of writing). Using some basic mathematics, and assuming it hit 13,000,000 on May 20, it’s likely that the site reached the new million in late September. The site hadn’t been updated much over the last few months, with the last update of any note happening in early September. A few more models were added today. In May, the site was on 3,665 models; now it’s on 3,755. As the increase in models has been pretty small, there’s been a real growth in traffic, and it’s the third four-month million-view growth period since the site’s inception. We’re definitely putting in more crossovers and SUVs lately, and that’s almost a shame given how similar each one is. With my good friend Stuart Cowley, we’re extending Autocade into video segments, and here’s our first attempt. It’s not perfect, and we have spotted a few faults, but we hope to improve on things with the second one. If you’re interested, you can subscribe to the Autocade YouTube channel here. Of course, given my concerns about Google, the video also appears at Lucire’s Dailymotion channel. Once we get a few more under our belt and refine the formula, we’ll do a proper release. And, as I close this post, just over 10 minutes since the start, we’re on 14,140,271. Autocade hits 13 million; and what’s the deal with Nissan’s withdrawal from mainstream passenger cars? Some time during May, Autocade exceeded 13 million page views. I can’t tell you the exact day, since it wasn’t a milestone that we’re socialized into noticing: I just happened across it one evening last week. It’s currently on 3,665 model entries, the latest being the Porsche 944. Admittedly, we haven’t added the premium brands as quickly as some mainstream ones. In other words, it has had more visitors in the last four months than in the same period prior to that. If the June 2017–January 2018 period was anomalous, then we could say that Autocade is getting progressively more traffic. Incidentally, Nissan, in both Australia and New Zealand, stopped selling passenger cars (apart from the 370Z and GT-R) last year, but it was only recently I came across their explanation. I had thought it was supply and demand, that people were heading into trucks, crossovers and SUVs more, but the official explanation is that Nissan knew about new Euro 5b emissions’ regulations and couldn’t be arsed to meet them. Still, to turn away even the rental market and hand it over to someone else doesn’t make sense, especially as a well understood rule in marketing is that it costs a lot more to get a new client than it does to retain an existing one. There’s no way Nissan didn’t know of this impending change, and it’s a shame it has exited a sector which it once sold very well in (remember the Sunny, or Datsun 120Y, of the 1970s?). With Renault New Zealand even more patchy in passenger-car sales, Renault Nissan Mitsubishi could find itself with a very small footprint here with passenger cars, especially as petrol prices hit their highest level yet. I’ve seen one sign where 95 octane is going for above NZ$2·40 per litre, and I paid a few cents shy of that last week. There are Qashqais and X-trails everywhere here, and maybe the group is perfectly happy with the economies it gets with those models’ Renault Mégane IV platform. And we’re not exactly a massive market. It just seems a bit short-sighted to me. As you saw in the previous post’s postscripts, it is possible to upload videos of longer than one minute to Instagram, but Instagram may or may not let the public see them. If you want people to see your videos for sure, then keep them to the standard minute. But if you want to chance it, so far my experience is 50–50, and there’s no correlation with length. Like all things Facebook, there is no consistency, and you are at the whim of the technology and its questionable database integrity. Here are the ones that have worked, the first at 2′50″, the second at 4′, the third at 3′51″, and the fourth at 7′03″ (this had to be uploaded twice as Facebook hid the first attempt). PS., April 28, 12.37 a.m.: A few more tries and the odds of a video lasting longer than one minute being visible to other Instagram users are definitely 1:2. The latest is this, at 7′53″. Don’t be surprised if these record zero views on Instagram. I believe their stats only count full views, and no one’s going to sit watching a video there for that long unless it’s particularly compelling. P.PS., May 4: I attempted a 9′03″ video. No joy. Instagram will allow the upload but the actual process takes an incredibly long time. The progress bar goes back a few times. Eventually it says there is an error. In theory, I think it’s possible, but right now I haven’t managed to exceed 7′53″. Above: Autocade can be hard work—and sometimes you have to put up less exciting vehicles, like the 2001–7 Chrysler Town & Country, for it to be a useful resource. March 8, 2018 marks 10 years of Autocade. I’ve told the story before on this blog and elsewhere, about how the site came to be—annoyed by the inaccuracies and fictions of Wikipedia (who said the masses would be smart enough to get rid of the mistakes? ), I took a leaf out of the late Michael Sedgwick’s book and created a wiki that had brief summaries of each model, the same way Sedgwick had structured his guides. I received an emailed threat from a well known British publisher (I’m looking at you, Haymarket, and as predicted in my reply, your thoughts proved to be totally baseless) when we started, and 12½ million page views later, we’re on 3,628 models (I think we finished the first day on 12), with our page on the Ford Fiesta Mk VII leading the count (other than the home page). Autocade began as a wiki but with so many bots trying to sign up, I closed off those registrations. There have really been about six contributors to the site, all told: myself and Keith Adams for the entries, Peter Jobes and Nigel Dunn for the tech, and two members of the public who offered copy; one fed it in directly back in the day when we were still allowing wiki modifications. I thank everyone for their contributions. A few years ago, I began running into people online who used Autocade but didn’t know I was behind it; it was very pleasing to see that it had become helpful to others. It also pleased me tremendously to see it referenced in Wikipedia, not always 100 per cent correctly, but as Autocade is the more accurate site on cars, this is the right way round. When a New Zealand magazine reviewed us, the editor noted that there were omissions, including his own car, a Mitsubishi Galant. Back then we were probably on 1,000 models, maybe fewer. All the Galants are now up, but Autocade remains a work in progress. The pace of adding pages has declined as life gets busier—each one takes, on average, 20 minutes to research and write. You wouldn’t think so from the brevity, but I want it to be accurate. I’m not perfect, which is why the pages get changed and updated: the stats say we’re running on 3·1 edits per page. But it looks like we’re covering enough for Autocade to be a reasonably useful resource for the internet public, especially some of the more obscure side notes in motoring history. China has proved a challenge because of the need to translate a lot of texts, and don’t think that my ethnicity is a great help. The US, believe it or not, has been difficult, because of the need to calculate cubic capacities accurately in metric (I opted to get it right to the cubic centimetre, not litres). However, it is an exciting time to be charting the course of automotive history, and because there are still so many gaps from the past that need to be filled, I have the chance to compare old and new and see how things have moved on even in my four-and-a-half decades on Earth. Since Sedgwick had done guides up to 1970, and paper references have been excellent taking us through the modern motor car’s history, I arbitrarily decided that Autocade would focus on 1970 and on. There are some exceptions, especially when model lines go back before 1970 and it would be a disservice to omit the earlier marks. But I wanted it to coincide roughly with my lifetime, so I could at least provide some commentary about how the vehicle was perceived at the time of launch. And the ’70s were a fascinating time to be watching the motor industry: those nations that were confident through most of the 20th century with the largest players (the US and UK) found themselves struggling, wondering how the Japanese, making scooters and motorcycles just decades before, were beating them with better quality and reliability. That decade’s Japanese cars are fascinating to study, and in Japan itself there is plenty of nostalgia for them now; you can see their evolution into more internationally styled product, rather than pastiches of others’, come the 1980s and on. The rise of Korea, Spain, China, India, Turkey, México and other countries as car-exporting nations has also been fascinating to watch. When Autocade started, Australia still had a domestic mass-produced car industry, Chrysler was still owned by Americans, and GM still had a portfolio of brands that included Pontiac and Saturn. I even used to go to one of the image galleries and, as many cars are listed by year, let the mouse scroll down the page. You can see periods grouped by certain colours, a sign of how cars both follow and establish fashion. There are stylistic trends: the garishness of smog-era US cars and the more logical efficiency of European ones at the same time; smoother designs of the 1980s and 1990s; a creeping fussiness and a concentration on showing the brand’s identity in the 2000s and 2010s. As some of the most noticeable consumer goods on the planet, cars make up a big part of the marketing profession. The site is large enough that I wouldn’t mind seeing an academic look at industry using the data gathered there; and I always thought it could be a useful book as well, bearing in mind that the images would need to be replaced with much higher-resolution fare. I don’t know if Instagram does this on all phones, but when I make multi-photo posts, it often leaves behind a very interesting image. 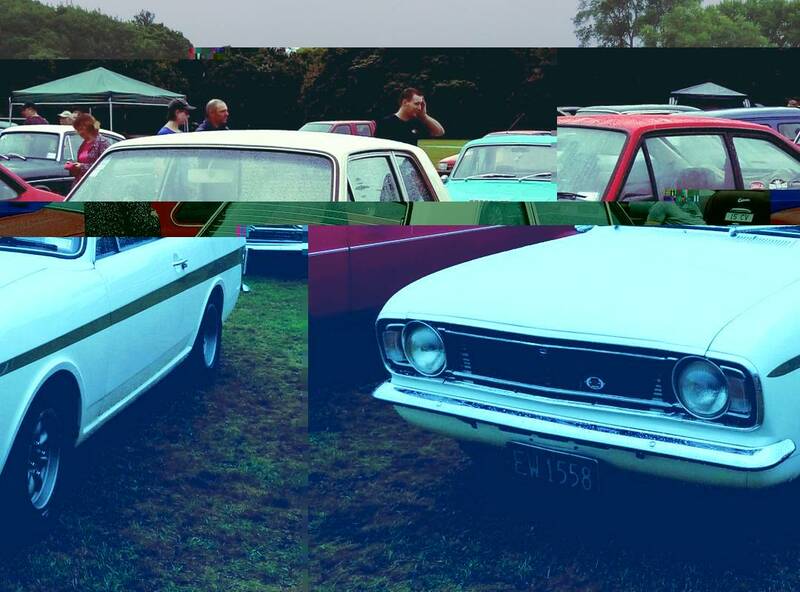 Sometimes, the result is very artistic, such as this one of a Lotus–Ford Cortina Mk II. You can see the rear three-quarter shot just peer in through the centre. I’ve a few others on my Tumblr, but this is the best one. 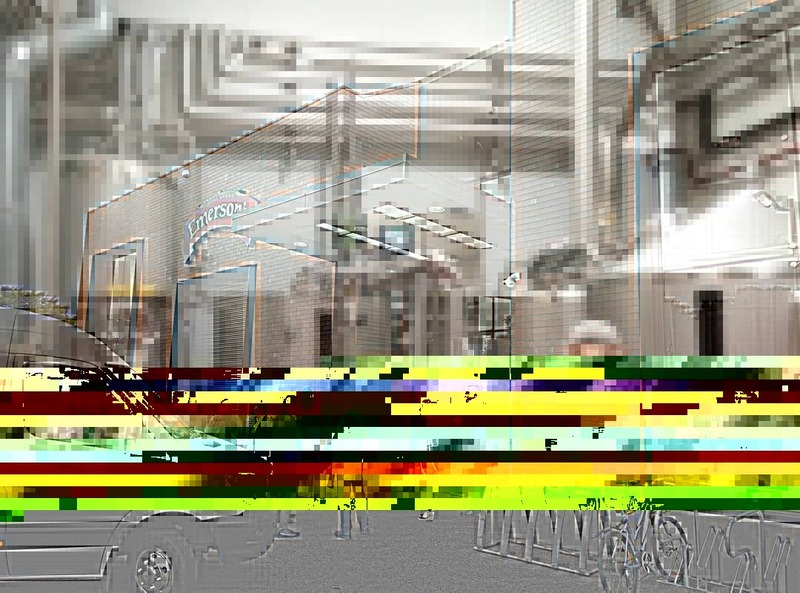 Sometimes technology accidentally makes decent art. I’m still claiming copyright given it’s derived directly from my work. PS., March 3: Here’s a fun one from my visit to Emerson’s Brewery. I bought Steven Parissien’s The Life of the Automobile: a New History of the Motor Car, which started off as a good history. I’m 300-odd pages in now and the mistakes are really worrying. There’s also a shocking lack of editing (one part repeated, albeit in different language, and spelling and grammatical mistakes) in the parts I’ve got to now; it’s as though the editor got tired after the first 10 chapters and stopped caring. But the biggest errors are factual. I am astonished to learn, for instance, that Harley Earl was responsible for the concept of the Ford Thunderbird (p. 255), that Triumph TR7 production was transferred to Speke in 1982 (p. 293, though Parissien later contradicts himself with the correct fact), and that John Z. de Lorean was a protégé of Lee Iacocca (p. 309). I really have no idea how, but as far as I know, de Lorean was never at Ford, and he had a Chrysler stint long before Iacocca got there. I also never knew that ‘In 1968 the Toyota Corolla became the first Japanese car to be manufactured in the US’ (p. 314; that was the year it went on sale there, and from memory the Corolla didn’t get built there till the NUMMI deal in the 1980s) or that the Opel Ascona C was also sold as the Opel Vectra (p. 337). The Italian Job was released in 1969, not 1967 (p. 224). I am frustrated with this book—and now it makes me wonder if the stuff earlier on, which I know less about, was accurate. I can understand an editor not grasping the subject as well as the author but there is less excuse in professional publishing for the other problems. Maybe there are few professional proofreaders left, now that spellchecks have been around for a generation or more. I was prepared to recommend this book even a week ago and tolerated the spelling and grammar, but these factual mistakes are worse than what can be found in Wikipedia, and I often label parts of that site as fiction. PS. (September 17): How much worse can it get, as I continued through? A lot. On p. 320, we get an admission that Parissien was wrong on p. 314: the Honda Accord was the first Japanese-branded car to be made Stateside. At least an earlier error was corrected. But they begin again on p. 321: Parissien claims the V30 Toyota Camry dominated the US mid-size car market (it was never sold outside Japan; he’s thinking of the XV10, or the Japanese-market Scepter, which was badged Camry). Correcting his error on p. 322, the Camry was not specifically targeted at the US; it was Toyota’s attempt to create an efficient car from the ground up, and it was not done in 1980, but 1982 (the 1980 Celica Camry was not sold outside Japan). The Paykan deal was cemented long before George Turnbull got to Iran (p. 324), though local content rose in the 1970s for it to be truly Iranian-made and Parissien might mean the shifting of the engine tooling there, if I’m being generous. There is only one world, not multiple ones (also p. 324), unless Parissien knows something about parallel universes that the rest of us don’t. Surely Chrysler managed to launch its T-115 minivan (Dodge Caravan, Plymouth Voyager) before Renault launched the Espace (p. 330), and the Triumph Acclaim was never called the ‘Ronda’ (p. 334), though its successor was. On p. 360, in a single paragraph, Parissien makes several errors. The MG 6 launched as a five-door car, not his claimed four. There is no such thing as the Roewe 150, in China or elsewhere. The MG 3 has five doors and is not a three-door counterpart to the 6. The five-door MG 6 launched not in 2011, but in 2010, and the Magnette name was only used in the UK for the four-door. The founder of Chrysler was Walter Chrysler, not Walther (p. 364). The Lancia Delta only became a Chrysler in the UK and Éire, as far as I know (p. 365), and remained a Lancia in most countries. The Belgian designer is Dirk van Braeckel, not van Braeckl (p. 368); Mercedes-Benz never bought an 18·53 per cent stake in Volkswagen (p. 369); and Citroën’s BX was not the last car in that range to have ‘pneumatic suspension’ (p. 372). The Malibu was not a Saturn, but a Chevrolet (p. 375), and Buick was never sold off (p. 376). The Ford Mondeo did not replace the Telstar in all Asian markets (p. 377), and it shared far more than the ‘windscreen, front doors and rear’ with the Contour and Mystique (in fact, the rear was not shared, though there were common engines, platform, and plenty more). It’s not entirely certain that the US market judged the Contour to be too small (p. 378), but there was a lack of marketing (which would have made an even better story than the one Parissien writes about). Ford subsequently filled the Contour’s niche with the smaller Focus Stateside. The CD338 Fusion was never sold in Australia (also p. 378). Ford never resurrected the Taunus in Germany under Alan Mulally (p. 381)—this invention is incredible. VAZ did follow up the 2101 with something similar after it ended production in 1983 (not 1984, p. 382), viz. the 2105, which was about as similar as one could get to the 2101. On p. 384, Parissien claims Acura’s Legend sales were ‘disappointing’, after saying they were ‘beginning to sell rather well’ 50 pp. before. The Hindustan Ambassador was not based on the 1954 Morris Oxford (p. 389): that car was actually the Hindusthan Landmaster. The Ambassador was based on the 1957 Morris Oxford III, and was in production from 1959, not 1958. The Red Flag (or Hongqi) marque was not reborn on an Audi A6 (p. 391), but the marque had been used on a version of the Audi 100 C3 from 1988, and no Hongqi bore an Audi–Chrysler–Hongqi brand name. The Chinese company is Dongfeng, not Dongfen (p. 391), and Parissien’s claim that the Everus was sold in the west (p. 392) is news to me, as I am sure it is to its own management. I’ll stop there for now. P.PS. (September 18): Some bedtime reading, or should I say error-finding, last night. On p. 394, Toyota and Aston Martin did not jointly develop the Cygnet: Toyota developed the IQ in 2008, and Aston Martin converted that car to become its Cygnet, and ‘hot hatch’ is a very optimistic description for a city car. Toyota did not launch the Cygnet in 2008 as Parissien claims, nor did it have a say in what customers were expected to purchase the Cygnet: it was aimed specifically at existing Aston Martin owners, not ‘Toyota and Aston expected initial demand to be limited to those who already owned an Aston Martin sports car.’ It was certainly no ‘eccentric experiment’ of Toyota, but of Aston Martin. Volvo never made a model called the A40 (p. 395), and I bet Nissan is surprised to find that the original Qashqai was designed ‘at the firm’s Milan design centre’ (p. 397) when it was designed in London. Maserati never launched a Jeep-based SUV called the Kubang (p. 397), but it did have a concept of that name, and the Levante appeared in 2016 after the book was published. There is no such car as the Porsche Cajun, and if Parissien refers to the smaller Porsche crossover, then that is called the Macan, and it has five doors, not the claimed three (p. 397). The Volkswagen New Beetle was not on a Polo platform (p. 399), but a Golf one, as was its successor (though a newer Golf); and Ford would dispute that its Mustang is a sedan (p. 401). If J Mays’s first name is J (as footnoted), then there is no need to refer to him as ‘J. Mays’ (p. 401). The Ford Ka’s name is not derived from StreetKa (p. 402): that was a model spun off from the Ka in 2002; and some would regard the Mk II model was being superior to the Fiat 500 on which it is based (especially as Fiat adopted some of the changes for its own model). I have yet to see a Smart with a Mercedes-Benz three-pointed star or marque anywhere, unlike Parissien who seems to think they are badged Mercedes (p. 403), and a Smart SUV does not exist unless Parissien is reporting again from his parallel universe (p. 403). There is also no such car as the Kia Exclusive (p. 410). The Porsche 901 was the 3,500th model entry into Autocade earlier this month. After lamenting in February that it had taken over six months for Autocade to get from 9,000,000 to 10,000,000 page views (prior to that it was every five months), I was happy to note that the next million took four months, which is a new record for the website. As long as unreferenced fictions like this keep appearing on Wikipedia—I don’t have to repeat earlier ones I noted, such as the ongoing, and annoying, falsehood of the ‘Ford CE14 platform’ page—there’s a place for Autocade. In fact, the additional growth suggests to me that the site is being used more regularly by netizens, and I hope that the work we’ve put in has been useful and entertaining. Our 3,500th entry, made on June 3, 2017, was for the Porsche 901 (unlike many other times, I had purposely chosen it). We’re not completely error-free, but we try to reference everything with offline sources, and, where appropriate, online (non-Wikipedia) ones. Thank you for your visits and for putting your trust in us. I was very saddened to learn of the passing of my colleague and friend Dave Moore on May 31, which I learned about a few hours after. You don’t expect your mates to drop dead at breakfast while on a press trip, especially not at the age of 67, and it’s particularly painful to know he leaves behind a wife and two children. The only solace is that he was doing something he loved, in a beautiful part of New Zealand, Wanaka. One of my good memories is driving with Dave along south Auckland roads, each of us in a new BMW 650i Cabriolet, during the press launch in 2011. Good manners prevent me from saying what speeds we were doing, but as this is a public blog, let’s say it was 101 km/h on a 100 km/h road. Remember Dave was 61 at this point but he still had the reflexes of a guy half his age. Having travelled up this road earlier (this was our return journey), we knew the likelihood of anyone coming the other way was remote. We decided to wind things back down to 50 km/h when we hit the main road and about 200 m down was a police checkpoint! We beamed innocently, as though we were doing the legal limit all the time. Dave was a good bloke. We didn’t always agree but we were always civil about it. On that I have no regrets. He hated mispronunciations (d’Or being pronounced as Dior was his pet peeve) and his politics tended to be further right than mine, but we never let that get in the way of a healthy respect for each other. He was in a good place in his life after quitting the top motoring post at Fairfax New Zealand, and doing his own thing. His daughter was moving up in the foreign service and doing exceptionally well, and he was deeply proud of her. The only photo I have of him is a silly one (he’s on the left and no, I don’t remember why three of us put the napkins on our heads) but usually when you’re on a press junket, you’re not taking photos of your colleagues! Dave was still posting on social media right up till his death, remarking how he was enjoying his view at his accommodation in Wanaka. There’s something fitting about his Facebook cover photo being his beloved dog, Ruby, walking alone into the distance. Our last conversation online was discussing the death of Sir Roger Moore a week before. Dave remembered Ivanhoe and we talked about Robert Brown playing the serf to Roger Moore’s Sir Winifred. Sadly, it wasn’t a car conversation, but it’s not a bad one to end on. My condolences to Dave’s family on the passing of a much loved and respected man.